I gave a public lecture at UC Davis last night about recent research on bias and its applications to religious thinking. Here's my latest version of the slides. I didn't know about the camera's location, so I paced in and out of frame a lot during the talk. But maybe my explanations of the slide points are useful. Was this talk recorded? if so where will the video be posted? The facial recognition and agency detection are tied together because of the high correlation of faces and agents. You need to watch your language. I did find the presentation interesting and believe that there are findings that are instructive to people in general. I was pleased that you were generous enough to say that these findings do pertain to everyone, but I was disappointed that you applied these findings particularly to religious people and committed one of the most common atheist fallacies, the genetic fallacy. You discusses how the hyperactive agency detection device (HADD), a mechanism that he claims was evolved to help man agents such as predators, and how our HADD causes us to see agents where they aren’t. You believe that HADD causes us to perceive gods who aren’t there. The problem with this assertion is that it commits the genetic fallacy because assuming that we have this evolved device it could actually be pointing us to God, in fact if God exists then it is quite probable that he gave us (either through evolution or some other means) this device in order to detect him. In any case the existence of HADD does not mean that God doesn’t exist or that the origin of the belief that he exists is incorrect. Later on in the presentation you discuss prayer, and calls theist’s claims that God answers prayers with yes, no or maybe later a fallacy. The problem with this is that it presupposes that God is supposed to be an omnipotent genie that must grant all prayers no matter how ridiculous or harmful they are. Bob could pray to be Supreme Dictator of the Universe so that he can torture and execute anyone who doesn’t bow down to him and the genie god would have to grant his prayer. What if Fred prays the same thing? This is a logically impossible situation, not to mention the fact that one of these prayers being granted would be a downright scary situation. The fact that all prayers aren’t granted does not prove that God doesn’t exist, or that prayer doesn’t work. God is not obligated to answer any prayers. God is a free agent who can decide which prayers should be granted and which shouldn’t, and he has the freedom to grant them when he sees fit. As an omnipotent, timeless being he has a better perspective then we do about which prayers should be granted and which shouldn't. Are skeptics really open minded? Next you talk about defense layers for Jesus vs. actively open minded thinking. The funny thing about this his belief that atheists/skeptics generally exhibit actively open minded thinking while religious believers are close minded, dogmatic defense lawyers for Jesus is that skeptics which are generally naturalists are closed to the possibility of God and miracles. How can a proponent of naturalism claim that they can make an objective open minded investigation into religious claims when they start with the presupposition that God doesn’t exist and miracles are impossible? The answer is they can’t. That is why proponents of skepticism/naturalism always will favor naturalist explanations, even if those naturalistic explanations are farfetched, because supernatural explanations are seen to be impossible. In fact it is kind of ridiculous to equate skepticism with open mindedness because the whole idea of skepticism is that it is a way to avoid possible mistaken beliefs by filtering out beliefs by demanding near if not absolute proof for that belief. So, the project of skepticism is the opposite of being open. Next you say that believers argue that God possibly exists. Perhaps some believers do argue this but I think most sophisticated believers say that God’s existence is highly probable. There is a huge difference between possible and highly probable because just about anything is possible, but far fewer things are highly probable. When I say that God is highly probable it is because I’ve looked at the world and concluded that God is the cause of the finely tuned universe and is the foundation of objective morals. I have reasons for believing that God exists. However, I realize that it is not possible to absolutely prove God’s existence because we don’t have enough information to do that. Then you move on to a weak analogy between an elf in a basement and God and his work in the world. The reason this is a weak analogy is because there is a huge difference between God and elves, unicorns, dragons and celestial teapots. One reason is that God is immaterial and resides in heaven while the elf is material and is said to be living in a basement. This means that even if the elf is invisible (how is a material object invisible anyway?) and really quiet there is a way to prove that he is there or not. You could use thermal cameras or radar to detect the elf, or you could use extremely sensitive microphones to detect the elf’s breathing or heartbeat. However, since God is an immaterial entity can’t be detected with current technology because we have no way to detect something that is immaterial. Another difference between the elf and God is that there is no good reason to assume that an elf would be in your basement. Although it is possible that an invisible elf is in your basement there is no good reason to think that there is one there. However, when it comes to God, he is said to be the ontological cause for the universe and the foundation of objective moral values. As an uncaused cause God plays a crucial role in answering the question why is there something rather than nothing. A final key difference between elves and God is that elves are contingent entities while God is a necessary being. Elves are contingent because they are material biological entities that need things like matter, land, food, water and oxygen to exist. We could conceive of possible worlds such as worlds without matter where elves could not possibly exist. However, that is not the case with God, a necessary being, because God does not require anything to exist. God can exist in all possible worlds. You says that believers go nuclear which is just a dramatic way of saying the argument from ignorance i.e. you can’t prove that God exists therefore God exists. Some believers may commit argument from ignorance fallacy, but all believers certainly don’t. Many believers say that God’s existence is probable. What you don’t mention is that skeptics can commit the argument from ignorance fallacy when they say that there is no evidence that God exists therefore God doesn’t exist. I enjoyed that talk. Thanks. You discusses how the hyperactive agency detection device (HADD), a mechanism that he claims was evolved to help man agents such as predators, and how our HADD causes us to see agents where they aren’t. You believe that HADD causes us to perceive gods who aren’t there. The problem with this assertion is that it commits the genetic fallacy because assuming that we have this evolved device it could actually be pointing us to God, in fact if God exists then it is quite probable that he gave us (either through evolution or some other means) this device in order to detect him. In any case the existence of HADD does not mean that God doesn’t exist or that the origin of the belief that he exists is incorrect." I don't think the argument from HADD is a genetic fallacy because genetic fallacy is the argument that assumes the nature of X's origin entails that X is either true or false. 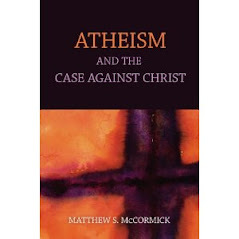 Matt was not trying to appeal to HADD's origin to debunk the existence of God, rather the mechanism and nature of HADD when considered through abduction infers that the best explanation (considered from the available evidence) is that the ubiquitous belief in God(s) can be best explained by HADD. But sure, it is possible that God placed HADD in there, but then you face couple of problems: First, HADD helps us to survive but it does not help us to form true beliefs. This would imply that God is a bad designer. Also, if God did give us HADD, then why would God condemn idolatry or belief in different religions if they were using the same mechanism God gave them? Second, this wouldn't be a parsimonious explanation for HADD when considering that Natural Selection alone is sufficient to explain how HADD came about, rather than positing an extra explanation that God placed it there. Later on in the presentation you discuss prayer, and calls theist’s claims that God answers prayers with yes, no or maybe later a fallacy. The problem with this is that it presupposes that God is supposed to be an omnipotent genie that must grant all prayers no matter how ridiculous or harmful they are. " No, Matt in no way was trying to presuppose that God has to answer all prayers. What he was trying to suggest is that prayers are fallacious because 1) It commits the fallacy of ergo propter hoc in which what happens after was caused by what happened before. 2) prayers commits ambiguity to the point that any event that proceeds afterwards can qualify for the vague request. 3) Matt also mentioned the "indeterminacy of time" which makes prayer fallacious because any event in any given period can qualify as fulfilllment of that prayer. 4)When prayers are not fulfilled according to our liking, we assume it is because God in his infinite wisdom knows what's best for us. But this is circular since it assumes that God has answers all prayers, just that in this case God answered it negatively. What Matt is trying to suggest, Keith, is that the fallacy of prayer disqualifies it from being sufficient testable and falsifiable because it includes way too many ad hocs that cannot be tested. "How can a proponent of naturalism claim that they can make an objective open minded investigation into religious claims when they start with the presupposition that God doesn’t exist and miracles are impossible? The answer is they can’t." How can religious people be anymore objective if they start off with the presupposition that naturalism is false? Even so, i think objectivity is possible for both sides if they try to consider evidences that are for their beliefs or not. I think Naturalism would be rendered false if there is actually an observable and testable event when miracles ensued by divine cause. So far, I don't think there are any sufficient evidence for that, so Naturalism has higher plausibility if so far we've seen only natural causes. 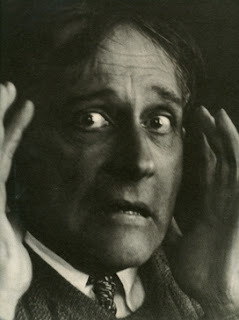 But what does it have to do with the picture of Stanisław Ignacy Witkiewicz? Some qustions and thoughts: Studies indicate traumatic stress as a causal factor in schizos. Is there research on HADD being stimulated during trauma? Also, if we habituate not attributing agency, are we removing a necessary survival mechanism, and if so is there a rational technique to replace it as quickly or more functionally than precognitive agency attribution? It takes more time to think than react, yet perhaps thinking is better (I.e. with tigers, just running is good, but crafting spears and arrows while digging tiger traps is better, and requires thought). I know from Shaolin Wing Chun that blind fighting is faster and stronger than visually tracking your opponent since sight requires more processor speed. If HADD processes like sight, then it should be replaced with logico-empirical principles. Given the link between agency and faces it would seem so, but the near limbic location indicates possibly not. Knowing reaction time differentials between rational and schizo test groups, along with cooperative tasks compared to how much brain processor speed is used seems important for the pragmatics of truth and survival. Being able to taxonomically classify the tiger eating my liver is less appealing than runnung from rocks and talking to cave paintings. But it seems the benefit lies with reason and cooperation. Is there any research like this out there?